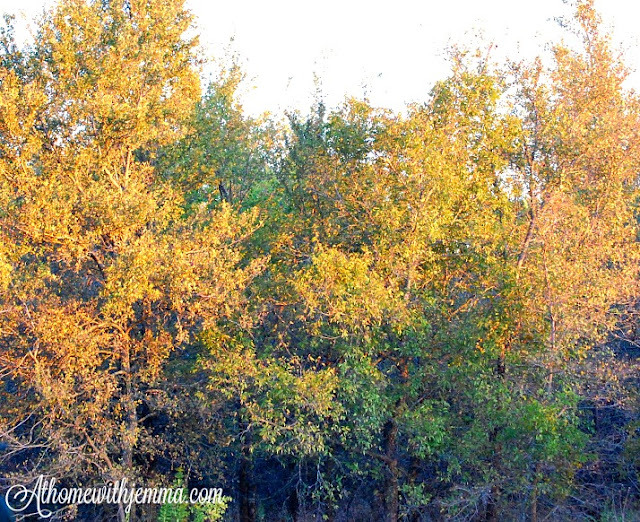 In her inspiring post, Jemma shares the joy that the Thanksgiving season brings. 'finding delight in simple things'. It makes perfect sense then that I love Thanksgiving. Thanksgiving is about hope and gratitude and the simple experience of sharing food and fun with family. 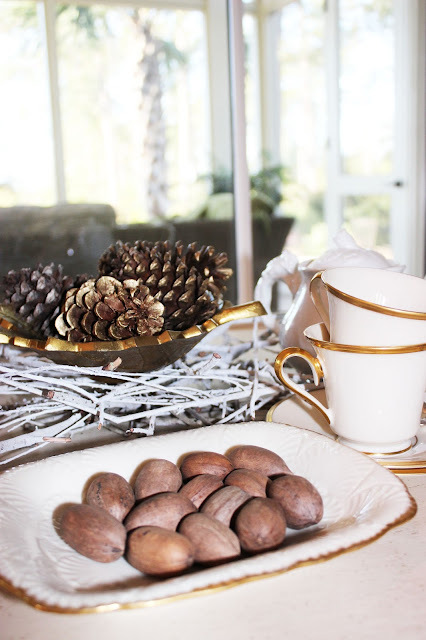 It involves all of my favorite things: planning a menu, preparing special dishes, using my Woodland Spode and setting a pretty table. It is about family, good food, laughter, football, and naps on the couch. Some of the best times center around this hutch in the sitting area of my kitchen. 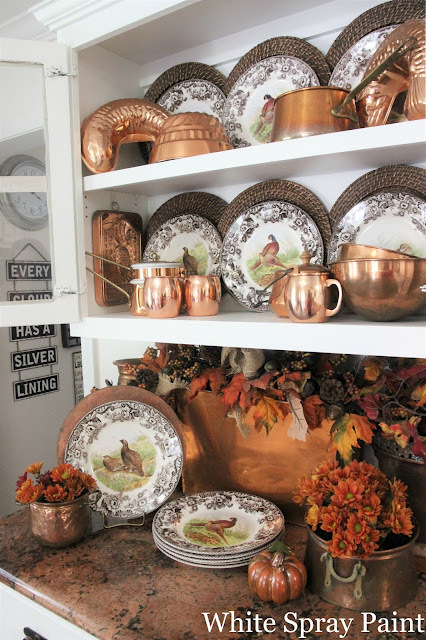 Woodland Spode and add all of my collected copper pieces from the flea market.
' just one more little piece'. Today I invite you to visit the last 5 bloggers in our tour. They are all so talented. Marty's beautiful talent and her generosity of spirit makes her a treasured blogging friend to all of us. 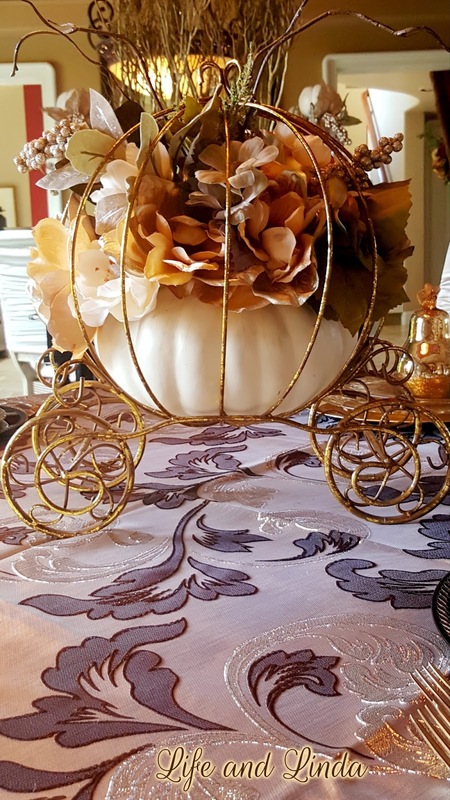 Rhonda's talent lies in her creativity, her love of home, and her ability in combining treasures both old and new. style, creativity, and natural elegance. 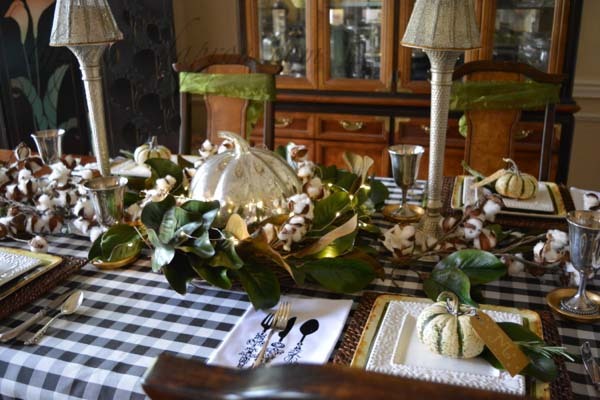 Jenna's lovely tablescape is just a hint of the beautiful things she creates on her blog The Painted Apron. Linda creates stunning tablescapes with her beautiful collections, and she is also known to many of us as a talented blog designer. If you missed anything this week, here is this week's schedule. It's also not too late to join the fun at Thoughts of Home on Thursday! So much eye candy this week! Thank you, Lovely ladies for sharing all your pretties! Thanksgiving remains my favorite holiday. I hope it never gets commercialized like the rest. I hope you are getting settled in to your "new" place, Stacey. I do hope you'll keep us up to date on the new house as it is being built. So excited for you! This has been amazing to see all the inspiration and talent. Love that Cinderella pumpkin. Have a great week end. Hope the moving is going well. Swoon! So many gorgeous tablescapes! Taking it all in today! Linking a little late but happy to join in! Have a wonderful weekend, Stacey! 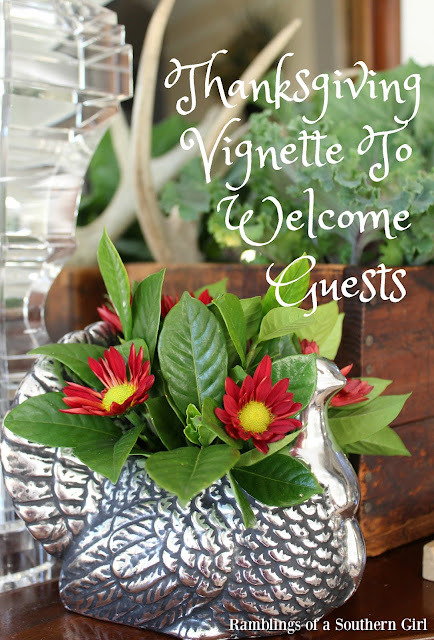 Beautiful vignettes! Love all of the copper and the pecan pies~wow! It is so good to be back visiting your beautiful, informative, and colorful blog again! I forgot about just how much inspiration lies within every blog post! Thank you for adding so much goodness to my morning cup of coffee. I especially liked that adorable picture of you and the man in the garden:). Stacey your plans & design for your new home to-be sounds beautiful. I can't wait to see it all come together, enjoy every minute of it. 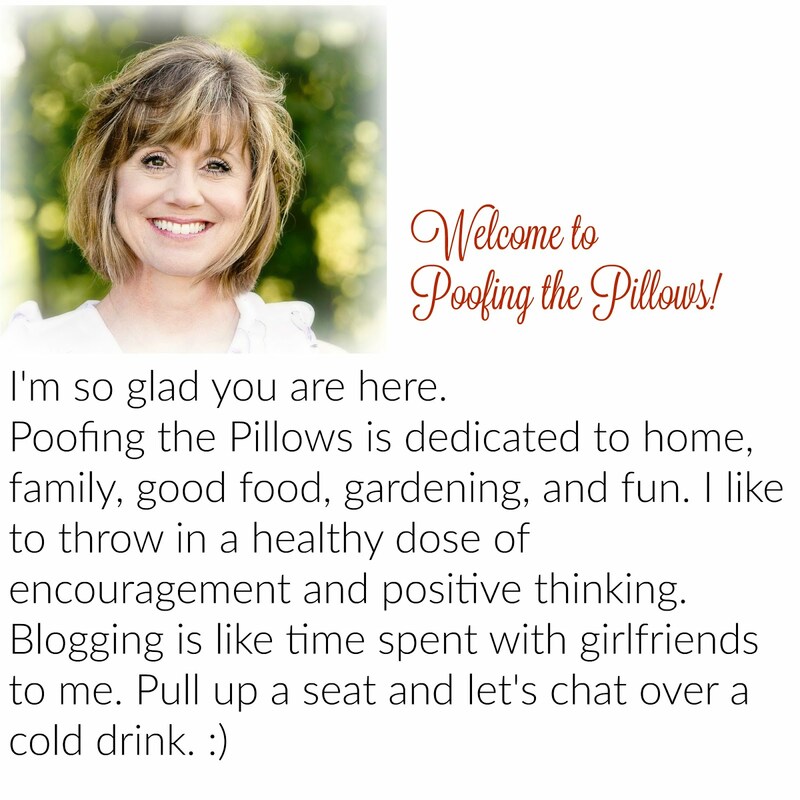 Your blog is also beautiful, so glad I'm connected! The December issue of Southern Living has a featured home that is jaw dropping, James Farmer is my newest crush, so love his stunning home.